My original intent was to make these sugar cookies and roll them in orange sugar to be festive for October, but I couldn't find any orange sugar in my baking cabinet. They still came out pretty though. 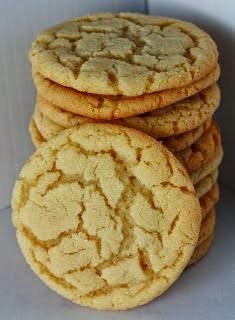 They are similar to the chewy Pepperidge Farm cookies, but they aren't quite as thick. I try not to eat much sugar, but I've already had 4 of these. That's how good they are! Using a mixer, beat together the butter and sugar until smooth and very fluffy. Beat in egg and vanilla extract. Gradually blend in the dry ingredients. Bake 8 to 10 minutes in the preheated oven, or until lightly browned. Let stand on cookie sheet two minutes before removing to cool on wire racks.